Many cargo claims arise due to lack of ventilation of the cargo, particularly agricultural products. A common procedure for ventilating hatches at sea is to `crack' them open. Considerable care must be taken during this procedure as the ships hatch tops are not designed to be opened during any rolling motion. When such hatches are opened they must not be left in the jacked up position, but should be lowered onto the compression bars and locked into position. Condensation occurs on the surface of the cargo as warm, moist air enters the cargo hold containing a cold cargo. For example, if a cargo of steel is loaded in winter in the UK for discharge in Singapore, the temperature of the cargo will be low. If warm moist air is later introduced in the cargo hold, condensation takes place as soon as it comes into contact with cold cargo. To avoid the possibility of cargo sweat, all ventilators should be closed and no ventilation carried out. However, if the moisture content of the cargo is high, extraction of the moist air from within the cargo holds may be required. Hygroscopic : mainly agricultural products containing natural moisture. They may absorb, retain or release moisture, depending upon the surrounding atmosphere. Examples include grains. On a voyage from cold to hot region these type of cargo need no ventilation and from hot to cold region surface ventilation needed. Air is said to be saturated if it can no longer absorb any moisture. If it is then cooled it will start to cause condensation. The temperature this occurs at is known as the dew point temperature. a record of cargo hold temperature and ventilation should be kept. For a hold loaded exclusively with cargoes containing no inherent moisture the only moisture available for condensation as ship's sweat will be the comparatively minute amount in the small mass of the volume of air within the hold. 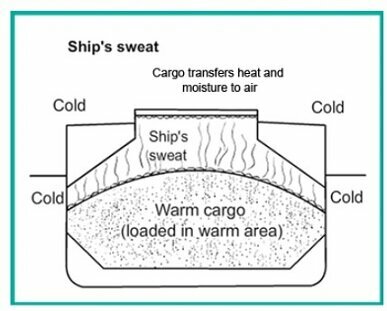 It is therefore highly unlikely that ship's sweat formation sufficient to drip back onto a cargo will ever occur under any voyage circumstances; the safest option for these types of cargoes is not to ventilate. Cargoes in the high moisture content category are usually hygroscopic - that is they can absorb or release moisture into their immediate surrounding atmosphere depending on the moisture content of the cargo and the concentration of moisture in the immediate surrounding atmosphere. Thus, the relative humidity and also the temperature of the atmosphere in a hold containing these cargoes is principally controlled by the moisture content and temperature of the cargo as loaded. (A proviso here is that these latter parameters are numerically suitably low for the cargo to be inherently stable, hence precluding the possibility of any significant self-heating in transit due to microbiological activity). It will be appreciated that the substantial amounts of inherent moisture even in stable cargoes of this type provide an enormous "reservoir" of moisture for potential release into the associated atmosphere within a ship's hold. This applies to a much lesser extent to cargoes in the low moisture category where the risk of any substantial ship's sweat formation is therefore correspondingly much lower. Usually, however, the same principles of ventilation apply to cargoes in the high and low moisture categories, although in the latter category there can be some exceptions. These include some organic and inorganic fertilisers in bulk or in permeable packaging where, for special reasons which are outside the scope of discussion in this article, the normal criteria of ventilation may not apply and it may be appropriate to seek specialist advice. 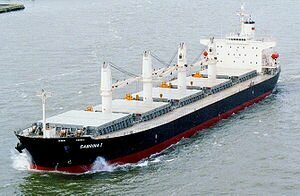 The need to ventilate especially high moisture content cargoes (stowage and sea conditions permitting), whenever external temperatures are significantly lower than cargo temperatures - and then not only in daytime but importantly also at night . If ventilation is impossible because of prevailing sea condition, it is of utmost importance that all relevant aspects of weather and sea conditions are fully logged. The only other circumstance where surface ventilation, when desirable, may not be feasible is when stowage considerations in relation to the design of a ship's ventilation system preclude effective ventilation. For instance, for cargoes of grain and some allied products in bulk, it is essential for stability reasons that at least some holds are fully loaded to the tops of hatch coamings, which may render surface ventilation difficult or impossible. In all other circumstances the text book rule concerning ventilation of the most hygroscopic cargoes containing significant amounts of moisture is to ventilate when the dew point of the external atmosphere is lower than the dew point of the atmosphere in association with a cargo within a ship's hold and, conversely, not to ventilate when the relative situation as regards external and internal atmosphere dew points is reversed. In theory this rule is entirely correct, since dew points of different atmospheres have a directly proportional relationship, to the absolute amounts of moisture which they contain.